The Korean company NAVIsis has developed a technology that can transform any old regular monitor into a touch screen monitor of sorts. 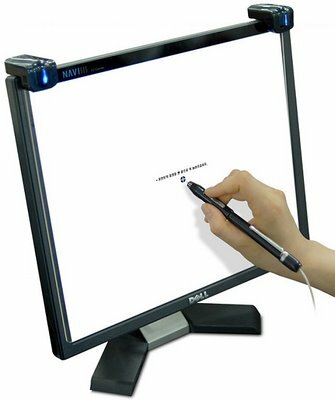 Their EZ-Canvas is a pair of sensors that you attach to the upper corners of your monitor, and when combined with a special stylus and their own proprietary software, you can treat your monitor as if it were a touch screen one: write on it, edit and select text, pretty much anything you can think of. And if using a computer all day has completely destroyed the quality of your penmanship, fear not, for the included software attempts to interpret what you’ve written and turn it into legible text. Of course this brings up the question of just how “special” that stylus of theirs is, seeing as though many LCD monitors are coated with a special scratch prone coating, guaranteed to be destroyed with just the smallest hint of pressure applied. Better keep that warranty handy.